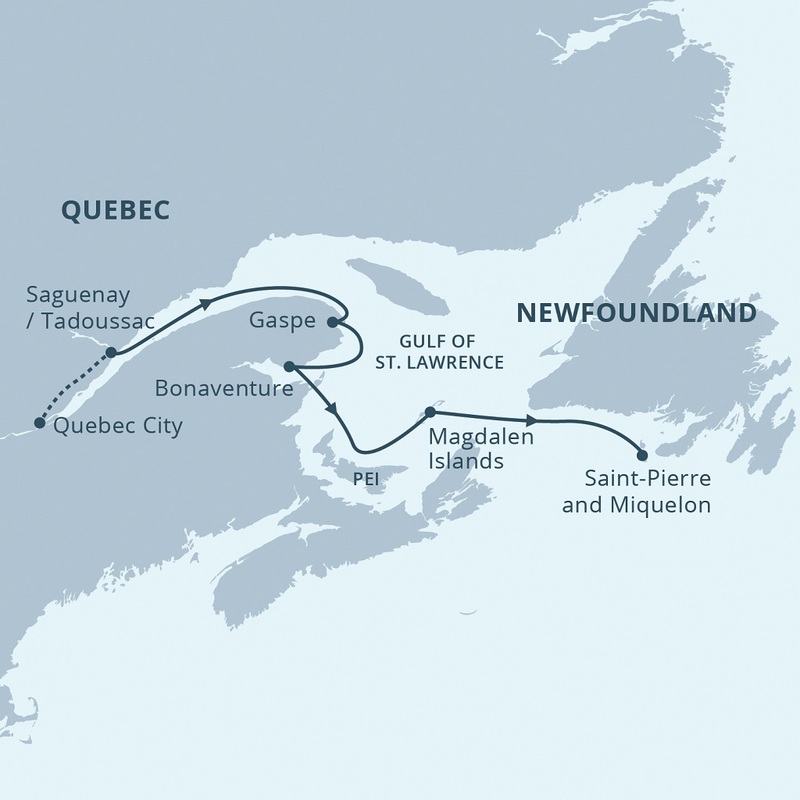 Mighty Saint Lawrence – The Great Canadian Travel Co.
2020 sailings, save 15% for bookings made by October 31, 2019. (See Tour Notes for details). One of National Geographic Traveller’s 50 Tours of a Lifetime, Mighty Saint Lawrence incorporates the stunning coastal regions of the Gulf of Saint Lawrence, including the Gaspé, the Magdalen Islands, Cape Breton, and Saint-Pierre. Prices below are regular prices and don’t reflect the 15% discount offered for 2020 cruises booked by 31 October, 2019. We will quote you the applicable discounted price at the time of your inquiry. One of the oldest European settlements in North America, Québec takes its name from the Algonquin word meaning ‘where the river narrows.’ The city that Champlain founded in 1608 was the capital of New France, and later, of British North America. Today, the proud capital of the province of the same name boasts the old-world charms of Vieux Québec, the world-famous Chateau Frontenac Hotel, and the only remaining intact citadel walls in North America. Cultural riches, superb cuisine, and an incredible view over the river make Québec City the perfect place to begin our voyage. A city tour is available for those who are interested in the morning. Travel by coach to the charming community of Tadoussac, France’s first trading post on the mainland of New France, located at the confluence of the Saguenay and the Saint Lawrence rivers. Originally established as an Innu settlement, it had become an important trading post by the seventeenth century, and was the oldest continuously inhabited European settlement in Canada. Today, it is celebrated for its vibrant local culture, dramatic scenery, and incredible whale-watching opportunities. Our group will meet mid-morning in Québec City for a briefing before embarking on a coach tour along the beautiful north coast of the Saint Lawrence en route to Tadoussac to embark the Ocean Endeavour. This voyage incorporates the stunning coastal regions of Quebec’s North Shore, the Gaspe, the Gulf of St. Lawrence, Magdalen Islands, and Saint Pierre. Marine mammals should be plentiful – some of the best whale watching in Canada is concentrated between the high cliffs of Saguenay Fiord. Anticosti Island, Mingan Islands National Park, Forillon National Park and Île-Bonaventure Provincial Park all offer wildlife opportunities including numerous migrating seabirds. The Magdalen Islands mix of Acadian and English influences—and a history of more than 400 shipwrecks—are among the islands’ unique features. It’s also home to endangered bird species including the Piping Plover and Roseate Tern. We bring our voyage to a close at Saint Pierre, the last remaining outpost of New France, where fine wine, good cheese and French fashion are to be found just off the coast of Newfoundland. Home to Aboriginal cultures for thousands of years, the Saguenay Fjord’s first European visitor was Jacques Cartier in 1532. The Saguenay drains fresh water from Lac St. Jean, but the greater part of its volume is salt tidal water from the St. Lawrence Estuary. The result is ideal habitat for marine mammals including four species of whales – fin, minke, blue, and the famous (endangered) Saguenay beluga population. Saguenay-St. Lawrence Marine Park and Saguenay Fjord National Park both protect the region’s vast natural riches. Today we will explore the Saint Lawrence River, famed for its incredible whale-watching opportunities, its rich history, and its vibrant culture. Sailing the river that gave rise to Canada’s European history is a thrilling experience, and we will set off through its heart for a true expedition day. Any stops is weather-dependent; ideally we will have favourable Zodiac conditions for an excursion. Parc national de l’Île-Bonaventure-et-du-Rocher-Percé is the formal name of the park at the eastern tip of the Gaspe Peninsula. But most Canadians are more familiar with its best-known feature, the awe-inspiring Percé Rock. Less well known perhaps is the area’s superb Northern Gannet colony, extolled as the largest and most accessible in the world. Named by Samuel de Champlain, the rock itself is world-renowned, containing a huge natural arch within a mass of reddish limestone and sandstone. A second arch once pierced the rock but collapsed in 1845, leaving a massive column at one end. Perce Rock has revealed 150 species of fossils, and more than 200 species of birds are found nearby. Fin, minke, humpback and blue whales ply the nearby waters of this magnificent coastal outpost. On a trip that traces the history and geography of New France, it’s appropriate that we wind up… in France. The small islands of Saint Pierre and Miquelon remain officially a part of the French Republic, albeit only a few dozen km off the shore of Newfoundland. In charming Saint Pierre (population 6,000) you’ll find fine wine and cheese, excellent coffee and pastries, even contemporary French fashion items in a post-card pretty town. European style dwellings stand shoulder to shoulder with typical East Coast architecture, and French license plates adorn the Renaults and Citroens on the winding old streets. Vive La France! Following disembarkation you will have the opportunity to explore the charming, colourful town before transferring to the airport for the charter flight from St. Pierre to St. John’s. Alternatively, you may book the option of a one-night sailing from Saint-Pierre, France to St. John’s, NL. You will spend the morning and afternoon touring the town of Saint-Pierre. In the early afternoon you will embark the Ocean Endeavour and sail across to St. John’s, NL on a one night sailing. We will not have any landings, but will enjoy a fun on-board program with music and entertainment, and have a chance to look for seabirds and marine wildlife en route to St. John’s. And you’ll get to experience sailing through The Narrows into St. John’s Harbour! Please inquire for availability and pricing.